TiVo execs sure are smiling now, shares soared $3.47, or 49.7 percent, to $10.45, after the news broke. TiVo executives in Alviso, Calif. are hitting an instant replay on this sweet moment: TiVo shares skyrocketed Wednesday after a federal court ordered rival Dish Network Corp. to pay the company $103 million plus interest for violating TiVo's patent by using a modified digital video recorder technology. Unless Dish's lawyers are able to persuade the judge otherwise, subscribers may find themselves unable to record and play back shows using the satellite TV provider's DVRs. TiVo shares soared $3.47, or 49.7 percent, to $10.45. The court decision, announced Tuesday, determined that Dish violated TiVo's DVR Time Warp technology patent, which lets viewers pause, rewind and fast-forward live TV shows. Dish lost a patent infringement case filed by TiVo in 2004, and modified its software while the case was on appeal. But TiVo said Dish's software still infringed on its patent and asked for a permanent injunction by the court, which was granted. 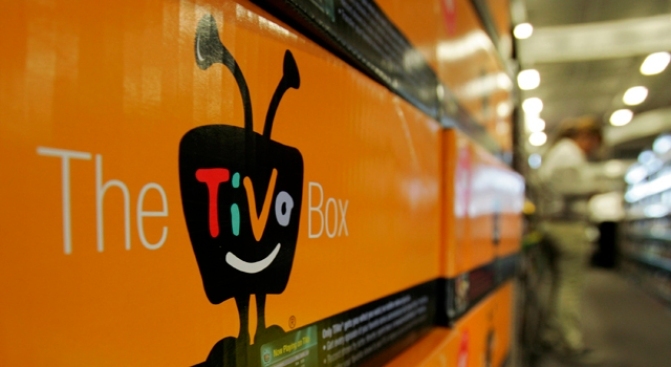 Janney Montgomery Scott analyst Tony Wible called the court decision "a major victory" for TiVo in a client note, and raised his price target to $13.50 from $9.75. The analyst, who rates TiVo shares "Buy," said the ruling should reiterate the value of TiVo's intellectual property and make it harder for cable companies to get around its patent by offering customers generic services. He also thinks it might make competitors more interested in buying TiVo to gain control of its DVR patent, either "out of fear or greed." Shares of Dish Network sank $1.79, or 10.4 percent, to $15.45. Collins Stewart analyst Thomas W. Eagan said in a note to clients that the company could be hurt if customers depart once the company disables the DVR function on patent-infringing cable boxes. Eagan, who rates Dish Network shares "Hold," said the company has been ordered to turn off this function on all but 192,000 of the infringing boxes within a month, which he thinks amounts to about 4 million boxes.